This unit is a great choice for a limited space cabinet footprint designed using no side access doors taking up valuable floor space when the door is opened. 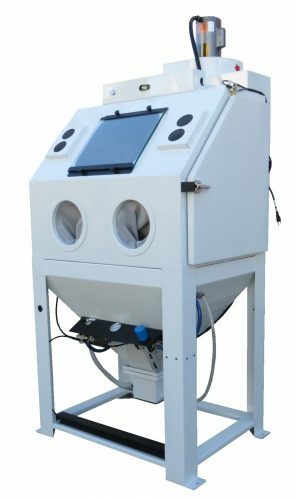 This top loading cabinet has a Patented Separator Reclaimer, 335 cfm blower and lots more standard features. 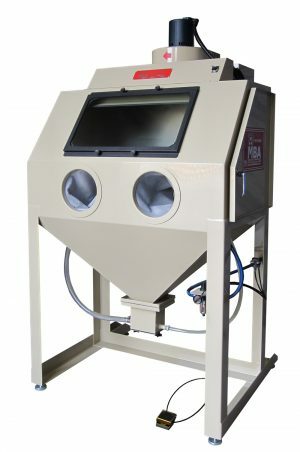 Unlike other small less costly blasting cabinets that try to hide behind a large cabinet size with no real machine features, the Space Saver HD uses a 16 cfm gun matched to the 350 cfm blower size using a Patented Separator Reclaimer that removes the dust and spent abrasive then returns the clean usable abrasive for recycle. Some units that only look large don’t include a foot operated blast pedal, media flow control valve, safety glass view window, window protector, and other important features that are standard on the compact Space Saver HD. 100% welded 14-gauge cold roll steel cabinet and no spot welds to leak abrasive during blasting. Large 8-inch diameter work ports and advanced LED lighting that says 21st century. If you want a 16 cfm gun size in a larger cabinet with even more features, look to the Cobra Stage I with two side access doors, a wider cabinet, and lots more standard features. 335 CFM @ 1” S.P. If you’re not sure whether the Space Saver HD is the best fit for your needs, check out our Buying Guide or give us a call - our goal is to help you buy the right machine the first time! Look for the Space Saver HD to blast all your hand held part sizes using 16 cfm of compressed air. 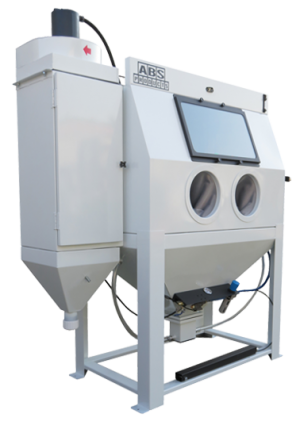 This matching of the cabinet size, 335 cfm exhaust blower and Patented Separator Reclaimer also includes all the features missing on the competition that only show a large cabinet photo with limited specifications. When you want visibility inside any blasting cabinet you must remove air from inside the cabinet. 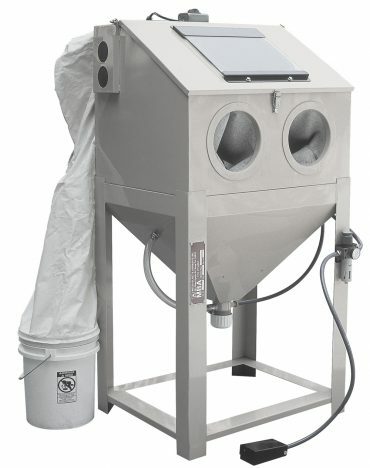 Without a good separator reclaimer you remove all the abrasive with the dust. If you use a vacuum blower, (100 cfm), the material being removed with the dust and spent abrasive settles back into the abrasive. This is like running a car without an oil filter and soon visibility is bad and you need to throw away the good abrasive to remove all the dust!